Whether motherhood makes you feel overwhelmed or whether you feel like you've found your stride as a mother, we are here to help you be the best mother to your children that you can be. We can also help you deal with infertility and prepare you for giving birth confidently and joyfully. We've got the resources you need to help your kids be healthier, to raise your children to be polite, caring people, to live more eco-friendly, and to make your home non-toxic. 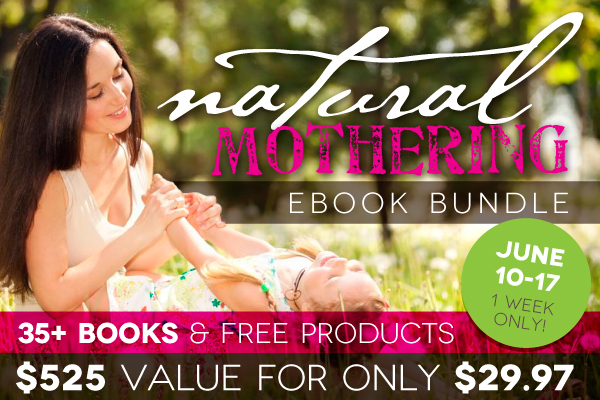 This is an amazing bundle great for mothers who love natural living, and I am so excited about it! I love using the resources God has given us to take care of our families! Disclosure: If you purchase this bundle through the buy now button on this post, you will be supporting this site with a percentage I receive through your purchase. Thank you so much! Want to meet the authors? Click here to read each author's bio. A Few FREE eBooks and eCourses - no purchase required! Because we are SO absolutely passionate about getting excellent natural living resources into the hands of every mother (and want-to-be moms and soon-to-be moms!) we've compiled a number of e-books that are FREE just for signing up for updates. There is no purchase required. Just see below for your freebies. Note: This sale is over, but be sure to sign up for updates to be notified of upcoming offers!